Who out there has been waiting with bated breath for a thriller to come along that mashes Christopher Nolan’s mind-bending Inception with the inner-mind-wandering madness of Tarsem Singh’s The Cell? Because that movie is here, and it’s called Mindscape. The Spanish-made film is the first feature directed by Jorge Dorado and first-time writer Guy Holmes, and it has just dropped its first English language trailer, as seen above. You’ll notice the preview and most news out there about the film relies heavily on telling people director Jaume Collet-Serra produced this film, and had a hand in getting it made. Unlike most films that hinge themselves to a name to sell the film to audiences, I think Mindscape actually looks better than any of Collet-Serra’s films, including the Liam Neeson action flick Unknown and the weird evil child horror Orphan. A good psychological thriller is so hard to come by these days. In the film, Mark Strong (Low Winter Sun) plays a man who has a unique ability that allows him to enter people’s minds and their memories. He takes on the case of a sixteen year old girl, played by Taissa Farmiga (American Horror Story), to decide whether she’s a dangerous psychopath or a trauma victim. She apparently tried to murder three people, but maybe she was driven to it by other duplicitous forces. The film also stars Brian Cox as the guy who brings the case to Strong, along with Noah Taylor (Game of Thrones), Saskia Reeves (Luther), Indira Varma (Human Target) and Richard Dillane (Argo). Sure, this is a somewhat ridiculous concept with no strong grip on reality, but there are few movies out there that take place inside of people’s memories, so hopefully Dorado will embrace the surreality of the human mind. It’s a very busy trailer visually, full of interesting (if somewhat strangely placed) framing, which will hopefully compliment the fractured narrative rather than just sticking out like a sore thumb. One has to assume there will be some major twist at the end of the labyrinthine story, which turns Farmiga from murderer to victim to brain stalker in just a minute and a half. I’m confident in the young actress’ ability to raise this performance above possibly trite waters. Strong is also a pretty solid actor, though he never looks like he’s having very much fun. Maybe he’ll live through one of her memories of a water park or something. 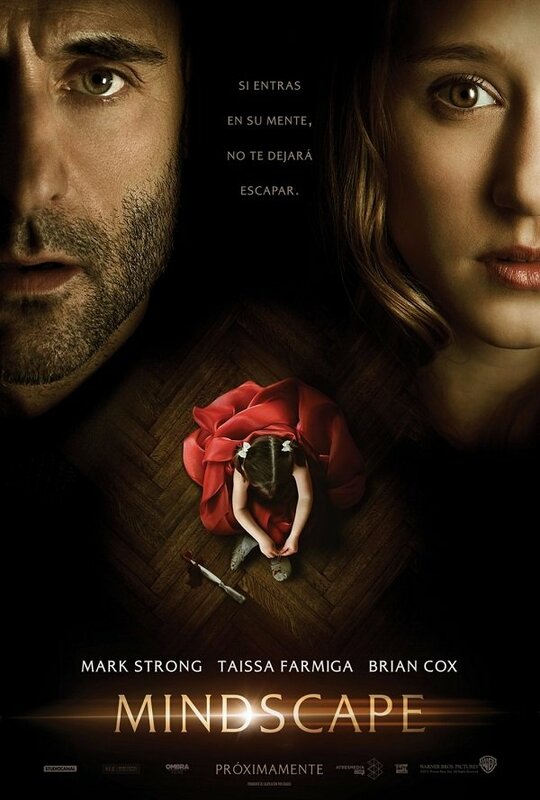 Mindscape premiered earlier this month at the Stiges Film Festival in Spain, and will be released there in January, though it does not yet have U.S. distribution.